The subject was a hot topic when The Shield was running white hot: What would it be like if The Shield ever went head to head with another legendary faction, The Four Horsemen? 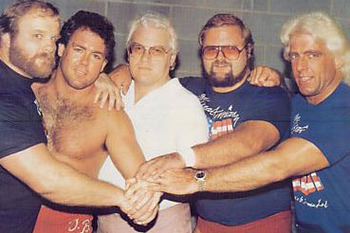 To make this Dream Match fit, you'll have to strip the Horsemen of a member to balance the odds. To me, the three men that always come to mind when thinking back to the Horsemen are Arn Anderson, Tully Blanchard, and, of course, the Nature Boy Ric Flair. While there were some respected members of the group through the years, these are the three that deserve to be part of such a fantasy. The individuality all three members of The Shield have created since the group disbanded has made the faction seem like such a distant memory. While I can't speak for all wrestling fans, I'm beyond mentally drained from all the complaining I've done about Roman Reigns being relentlessly forcefeed by Vince McMahon. But before the constant whining, Reigns was the muscle and the enforcer of the group. There's a reason he's gotten the push he has, despite it's unnecessary longevity. So, speaking of enforcers, lets talk about the man who was actually known as "The Enforcer," and that's Arn Anderson. I'd argue that Anderson was underrated in the overall scope of wrestling history. He wasn't flashy. He didn't have "a look." But what he had was the ability to cut some of the most intense promos you'll ever hear, while also delivering a "no nonsense" technical style in the ring. At one point, people would ask me who my favorite wrestler was and I'd mention Arn Anderson. They'd respond with, "really?" But as the years have gone by, they've come to understand the genius that was "The Enforcer." Setting the enforcers aside, you can mix and match the combinations of Seth Rollins & Dean Ambrose versus Tully and Flair. These become dream matches in themselves, but I personally like the idea of the "unhinged" personality of Ambrose against the hot temper of the Nature Boy. We've seen plenty "chop versus chop" scenarios with Flair and any opponent through the years, but this seems like it would be just that much more intense. You can't help but to think back to a throwback match with Piper or Pillman, when thinking of Ambrose versus Flair. While no one in the history of the Horsemen probably had the agility of Seth Rollins, Tully plays out to be the most intriguing matchup. Tully, much like Arn Anderson, doesn't get the just due he deserves as a wrestler. I'm not sure if it's because his career didn't last as long as the others or what, but his name needs to come up more often. Rollins needs to be the face in this competition, because it's hard to think of Tully as anything but a heel. I'm envisioning a scenario back on he NWA/WCW Saturday Night set. Picture The Shield raising havoc in that studio atmosphere. Maybe it's a nostalgia thing, but I'm getting goosebumps just thinking about it. Flair cuts another classic promo with the Horsemen at his side, before The Shield emerges for the first time on TBS and shares a staredown with the group. Ambrose delivers a few choice words to Flair, getting him hot under the collar, loosening his tie as his face turns beet red. "You want us, you got it!," Flair screams. This feud could possibly challenge the Freebirds/Von Erichs as the best rivalry between two factions in history. There's one gimmick match that makes this dream match/feud all the more interesting and that is War Games. 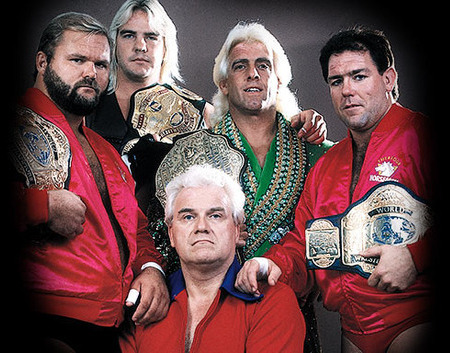 So, lets tack on that fourth member of the Horsemen, we'll call him Barry Windham. 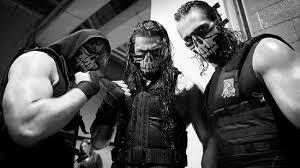 And who would join The Shield to even the odds? It can be anyone. I'd personally put Dusty Rhodes, The American Dream and The Shield versus the Four Horsemen. Sounds good to me! Keep on dreaming.